Welcome to Floral Notes! A studio based business in Acton, Massachusetts, I look forward to connecting with you so we can discuss flowers! Please use the 'contact us' page below and together we can create flowers that send the perfect message for your event! I have a passion for flowers that started with competing in flower shows and evolved into a special event business. Staying current with trends and techniques through symposiums, workshops and seminars is a priority. As a National Garden Club Master Flower Show Judge, I am very particular about the quality of the designs I let leave my studio. These designs were created for flower shows, Worcester Art Museum's Flora in Winter, and other design challenges. Selected for the cover of National Garden Club's Vision of Beauty 2017 Calendar. Winner of the Cindora Goldberg Award 2014 - Copyright photography by Charles Mayer Photography (images not to be used without written permission). Woven flexigrass and deconstructed lilies combine to form a rhythmical design. I was honored to represent the Acton Garden Club with a floral interpretation of Bhairava or Mahakala at the Museum of Fine Arts' Art in Bloom. Multiple leaf manipulation techniques were used to reflect the detailed carvings on the statue residing in the Southeast Asia Gallery. Recipient of The John Taylor Arms Award given to the blue ribbon entry scoring the highest number of points - given only once during the show and the Massachusetts Horticultural Society Natalie W. Wolf Award given once during the show for the inspired use of plant material. Side view of above design. Bi-color phalaenopsis marries the white phalaenopsis to the underlying berry hues of the carnations and cymbidium orchids. Angel vine (Muehlenbeckia complexa) flows through the design. Boston Flower Show 2015 - Bursting Out! Red willow was wired to create a structure from which Starfighter lilies burst out. Flexigrass with hypericum berries threaded on, fiddlehead ferns and wire balls ty to escape adding tot he exhuberant feeling. Winner of the National Garden Club, Inc. New England Region's Deanna Mozzochi Award for the Best Creative Design of the Year. Newport Flower Show 2012- Class title - Mercado! Winner of the The Preservation Society of Newport County Design Award (displaying the most creative use of the majority of challenge components). Pink 'protea' on left is a wisk, small circles on midolino are cut sponges, center uprights are painted straws, and bits of wool were used as part of the design in this design using 2 containers that were stacked. Newport Flower Show - 2011 Class title "Tennis in the early 1900's"
Blue ribbon winner - Flexigrass was wired to form 'racquets', tennis balls were used to hold craspedia. The Narrow Wave made by Blackwater Floral Accessories (Ireland) was the 'net' but also acted as a mechanic. I created a time-lapsed sunset with wired willow, calla lilies, proteas and other plant material arranged in a colorgradient. Awarded the Jeanne-Marie Parkes Award given to the design judged by the evaluation panel to be the most creative interpretation of the class title. I created a large hand-tied arrangement by layering wired flexigrass structures (which I created) with flowers to interpret this Roberto Coin multi-stone ring. Maureen gives programs and workshops for garden clubs. Below are four of her most popular demonstrations. Please contact her to tailor a program to suit your needs. Arrangements to welcome the fall and winter holiday seasons including design tips and a bit of history about the origins of some common customs. Designs for your dinner party, cocktail party and special occasions will be demonstrated. Mother’s Day, Father’s Day, Graduations, Weddings – spring time celebrations. Add a special touch to your next get-together with arrangements ranging from Traditional to Creative Styles. France, Iceland, and Japan are just a few of the countries we will visit. Designs reflective of various countries will be created with a ‘tie-in’ to an assortment of scarves. Learn some of the many ways you can use midollino. In this workshop, you will make a design as well as see many other ways to use midollino to enhance your creations. This workshop introduces different leaf manipulations and techniques with foliage and midollino. Braiding, tatami weaving, traditional weaving, spiraling are among the topics covered. Actual techniques done by participants can be customized for your group. Various structures suitable for bouquets and centerpieces will be presented. 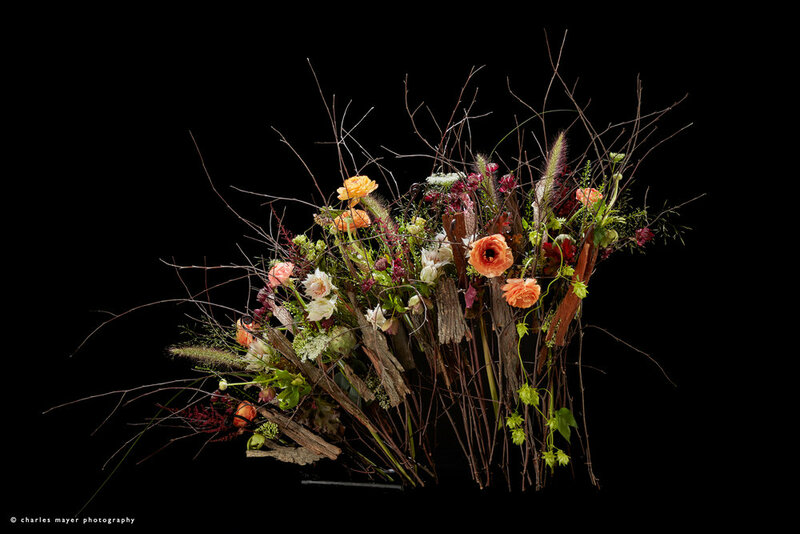 Participants will create a structure and enhance with flowers. This workshop can be customized for your group. I am pleased to serve as the USA Distributor for Blackwater Floral Accessories, Ireland, featuring iron work designed by Tim Mulchinock. Ann McDevitt, the previous distributor, has moved back to the UK. Some of the items shown in the pdf. have additional information or links to video on Blackwater Floral Accessories website –www.floralaccessories.com. Due to shipping costs from Ireland and the fluctuating exchange rate, prices listed on the Blackwater site will not be accurate. Please refer to the prices and additional products in the pdf. Click here for Blackwater Floral Accessories pdf.